World Journeys has a dedicated groups department specialising in tailor-made group arrangements to diverse destinations including some of the world’s more challenging places. Our team of destination specialists use their up-to-date personal experience of their specialist area to create the perfect itinerary for the client. From the best accommodation in the best locations to truly authentic cultural experiences, we will work with you to ensure not only a seamless experience, but to build in that ‘wow’ factor that will keep them coming back for more. 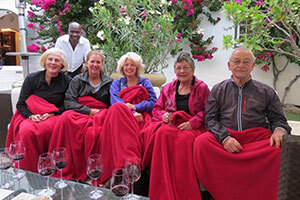 Group travel requires careful planning and meticulous execution. Allow plenty of lead-in time for us to fine tune the perfect itinerary. Get inside your clients’ heads and qualify exactly what their needs are. Use our knowledge to create an incredible itinerary to suit those needs. Don’t be afraid to think outside the square and upsell. Ask us about the special touches we can include that will really “wow”! Consider new destinations that won’t have been ‘done’ before to get ahead of the competition. Offer pre and post tour options for those with more time and budget.